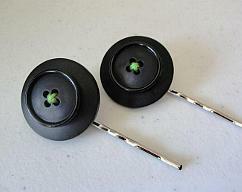 Versatile and stylish accessories you can use anywhere! Use them to display your favorite photos at home or in the office. 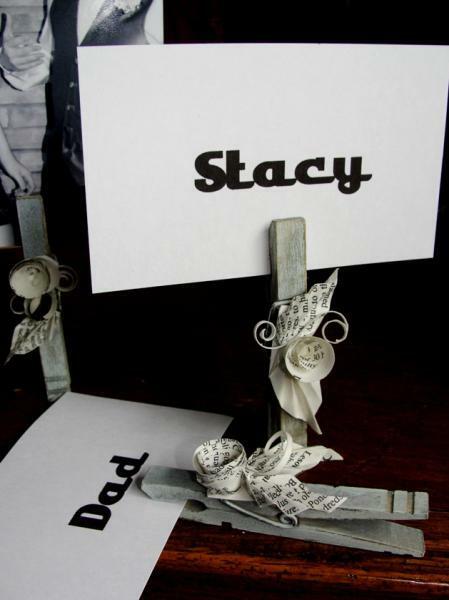 Great place card or photo holders for a wedding or party. Shows off your eco-friendly spirit too! 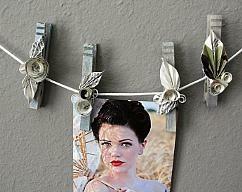 Each embellished clothespin is adorned with paper roses and leaves created from vintage book pages. They are rolled, folded and sealed for longevity. This listing is for 5 random clothes pins similar to those shown here. Each is uniquely hand made but equally beautiful. 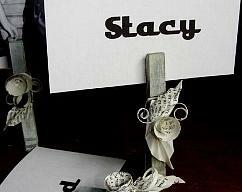 We'd love to quote prices for large quantities for your wedding needs. Just ask us! Our photo display kits are available separately. 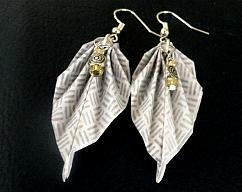 Check out our whole line of coordinating Paper Roses and JunkMail Jewels products.